The gentle, intelligent and family-friendly Labrador Retriever continues to be the most popular breed in the United States. This versatile breed comes in four colors – yellow, black,chocolate and white – and because of his aptitude to please his master they excel as guide dogs for the blind, as part of search-and-rescue teams or in narcotics detection with law enforcement. 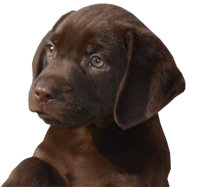 An ideal family and sporting dog, the Labrador Retriever thrives as part of an active family or as a trusted hunting companion. A double-coated breed which sheds seasonally, regular grooming keeps his coat at its water-resistant best. Because of his even temperament and trainability millions of Americans own a Labrador Retriever as a pet. All our Labrador parents are AKC, DNA, OFA, Hip Certified and have many outstanding champions in their 5 generation pedigree. Our puppies are available in chocolate, yellow, black and pure white. They are microchipped, vaccinated, and veterinarian certified. For information on present and future litters, please call 631-727-3550 or e-mail info@sportsmanskennels.com.